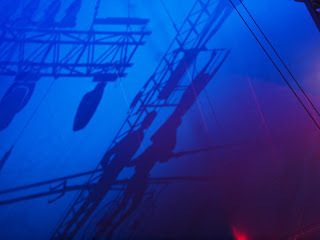 The tightrope walkers were magical - and scary. These two are part of the German 'Famille Weisheit' who have been in circus for 100 years. They were awarded a Special Mention by the Jury at this year's Festival. Fantastic photo, Jilly. Looks scary, but so fascinating. You and your camera are doing very great work!! A lovely photo, very crisp and clear colors and a nice angle you captured. 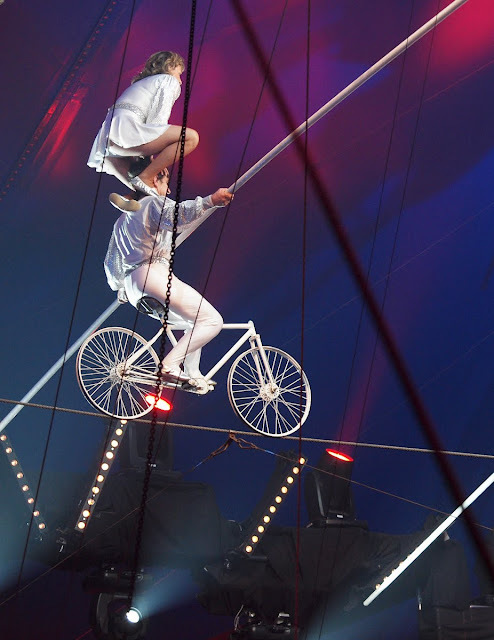 I guess you do not need handlebars on a bicycle if you are going to ride on a high wire. I get nervous just looking at them! I usually watch these with my eyes closed. Scary is right! The compressed tele perspective makes it look like his balance pole might get stuck among the guy wires. Gorgeous, and their skill is evident! I'm so busy getting ready for another show. I just had a look at your fabulous circus shots. How on earth do you get the clarity and color and sharpness?? ?